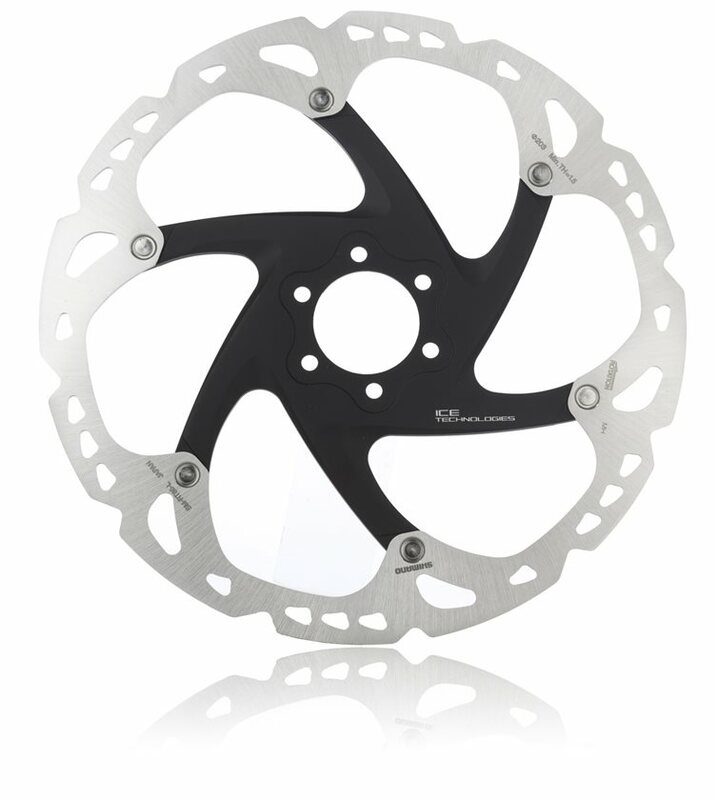 With riding styles growing more aggressive and varied, a better brake rotor was needed. Shimano responded to the needs of riders to deliver best-in-class braking power, better system cooling and the best brake feel. Enter the Ice-Tech Rotor. The Shimano XT RT86 rotor is infused with proven Ice-Tech braking technology, trickled down from the top-end XTR group. Ice-Tech is a technology that blends the durability of a stopping power of a steel rotor with the heat dissipation properties of aluminum. By sandwiching an Aluminum cooling core between two steel braking surfaces, the rotor dissipates heat faster, while the steel outer portion provides solid stopping power and a durable braking surface. The two-piece "floating" rotor arrangement also saves weight and increases system stiffness, giving you the intense braking power you need, with the reliability and survivability that Shimano is best known for. Hit every line with confidence and speed with Shimano XT Rotors! 6-Bolt disc brake mounting fits 6 bolt hubs. Great stopping power, looks great too. I bought this to complete my build on a yeti SB-66. This rotor is huge, and has plenty of stopping power. I have XT brakes, and this worked great with them. I haven't experienced any fade at all, even during heavy, repeated braking. Shimano engineered the ice-tech rotors with an aluminum core which will dissipate heat better. Great rotors! Upgraded to these with me my ZEE brakes and they work great. Stopping power at its best . These rotors keep cool under the highest braking conditions. Never once Have I noticed any sort of brake fade. I love that it is a two piece rotor! Doesn't get much better than Shimano's Ice Tech stuff. Technology meets attractive and lightweight design. Would work great in any brake system where applicable. I bought the 203 version for my Yeti SB66. Powerful stopping and no fade even on long descents. Great rotor, very easy to install. One word of note: instructions are outdated and reference a washer and triangle screws. The screws are no longer triangle, and Shimano no longer uses a washer for these rotors. Just tighten the screws and lift the flaps. I found it a little easier to lift up the tabs first, then tighten everything - otherwise it's impossible to pry the ends even with a tiny flat screwdriver. 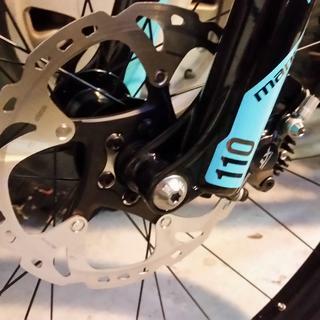 Been using the Avid G2 Cleansweep rotors with XT M785 brakes for this past summer and the rear brake was never quiet. Stopping power was there but it was a bit of an on/off with metallic pads. Finally got to replace the rotors with the Ice-Techs and my problems are gone. True out of the box, great stopping power and better modulation. I ordered this as part of a 1x11 drive train upgrade I did on my Giant Anthem. I had previously ordered the new XT M8000 brakes for the upgrade, but planned not to replace the rotors as it seemed like a waste considering the rotor were not that old, but after getting the new brakes on the bike I thought maybe I should. After getting them installed, I was glad I did. The new setup with the M8000 brakes and these rotors stops on a dime. Issues I previously had with heat build up on long descents with my old SLX brakes are now no existent. Worth every penny. Installed these rotors in place of my cheap one piece rotors that came with my bike. The old ones were chattering and warping after heavy use. Installed these and everything is back to normal again. Replaced a rear 160mm with a 180 and live the increased grip this gives. So far I’m really happy with them. Have about 15 miles on them with new pads and they bite and hold strong. Took about 15-20 hard stops with the new pads before I would run them on a trail. Quick reliable delivery . good service as always. I swapped the cleansweep G3s for these along with the Xt brakes. So far, amazing rotors. Silent, zero fade on even longer downs. I weigh over 200lb and use 180/160 and it stops me on a dime. My favorite part about these rotors is that there is serious design and thought behind the product. It's not just another steel rotor with a "cool" pattern. Pretty easy to install. 145gr including bolts for 180mm version, 127gr including bolts for 160mm version. Installed these XT rotors and a new set of XT level brakes on my Nomad in place of Avid elixirs and clean sweep G3 rotors. Power is exceptional with the Shimano's and these rotors help keep it quiet consistent and smooth. The hardest i've pushed them was a 7 mile DH run with no fade or squeal, pushing deep into the corners with out a second thought that performance would be above par. I'm not anti Avid, (even if mine did howl like a dog under a full moon) I just find the Shimano's to be so far ahead of the curve it makes others in this price point seem irrelevant. 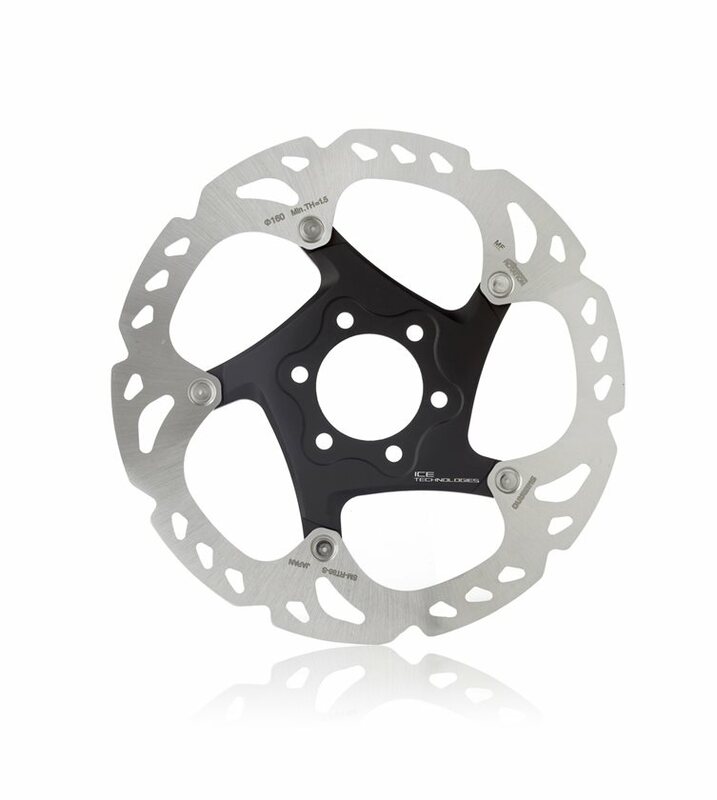 Great rotors, a little heavy but amazing stopping power. I got two sizes, 160 and the 180. The 160 was missing the fixing washer as shown in the instructions, but I think it isn't really needed and the instructions should be updated. The bend back washers are a little funky to install too, and almost guarantee that you will scratch your rotors while bending back these washers. It's probably a good safety point though. These are good rotors with nice life. They are heavier than other options though. Ive got the non ice XT, but has the same center hole, where the axle goes thru. If you use 20mm front axle. Be careful when washing your bike, cuz water can get trapped between the center hole and axle seal.Since the rotor center hole is smaller then the spacing for the 20mm axle. I have 2012 crossmax st wheels with horrible axle seal design. The disc side bearing seized cuz of no water run off and poorly designed seals. Not a good combo wheel and rotor if you wash your bike often.Im going back to solid rotors with the new SLX, it has cut outs between the mounting bolt holes for water run off. But i do love the design of the xt 2 piece rotors.Looks sic and worked flawlessly. Oh and with the crossmax wheels? A whole other story. Actually in the mavic crossmax review in this website. The quality and stopping power you expect! My standard go to rotor. 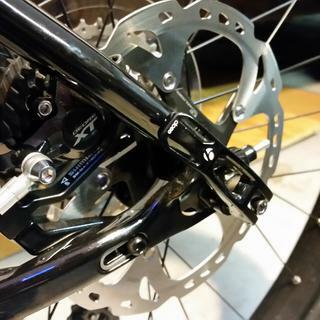 They are always straight, install and set up easily and provide ample stopping power combined with my XT brakes. Fast shipping and excellent customer service as always! Product arrived quicky and the packaging was in excellent condition. The Ice-Tech rotors do a great job on my bike of stopping quickly and staying quiet. Have these on all my mountain bikes. Great product. Breaks are running brilliant. Eliminated 95% of front brake squeal on Avid BB7. Don't waste your time and money trying different brake pads. This rotor solved the constant front brake squeal that has plagued my bike since new, over 3 years now. Great value, no fade, quiet, best brakes made! You can spend more, but nothing works better. Great price for amazing performance!! They are Ice-tech rotors... buy them! They stay cool under hard braking. I’ve been riding these rotors for years and never had a single problem or brake fade. Plus they come with the bolts and locking shims for the 6 bolt. These were for a 29er wheelset to go with my 27+ set, and they work perfectly. 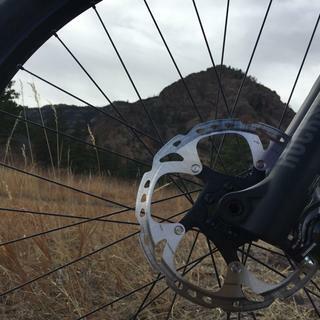 I have converted all of my mountain bikes to the Shimano XT RT86 rotors. 203mm rotors give lots of extra stooping power. Would recommend to a friend. Dissipate heat quite well. Takes more to cook these on steep downhills. I use these rotors on all my normal builds and pair them with shimano servo wave brake setups. These rotors stand up to big rock gardens well and I have even landed on my front 180mm rotor messing up on a skinny. Rotor vs. 2x4 the rotor won! Easy to true with minimal flex back. I tried hope floating rotors. they cost more and the dumb rivets hit my brake calipers ( XT ). Went back to XT. Not expensive, work. i like. I also have used weight weenie ( ashima ) rotors in the past with some luck, but they do tend to get out of true faster. Great stopping power, light weight. Great product!!! I recommend it if you want to upgrade your brake system!!! UPS lost the package for a couple days in one of their warehouses, but it arrived intact. 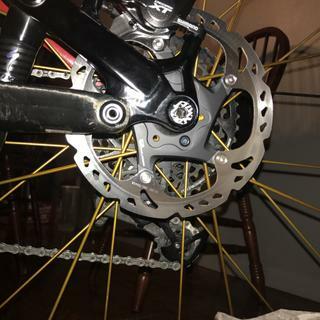 Many of my bikes have come w/stock Shimano rotors and while overall the brakes are good/OK the ICEtech rotor upgrade will cost you but is soooo worth it. Way better stopping power, way better heat dissipation (allegedly stainless steel bonded over aluminium discs). Just watch out I think there's like 5 versions out there and the lowest one isn't quite as sweet! Quality parts, best price and fast shipping! Good looking strong rotors that should dissipaitbheat better than all steel options. To early for a in depth review as I have not got to use them for any serious prolonged heavy braking but they are nice and quiet and modulate well with the Shimano Zee brakes I paired them with. Upgraded my entire braking system from Avid to the XT. All the reviews are correct and could not be happier with making the switch! Easy to install, so responsive, and most of all it doesn't scream like a dying cat as I descend. Complete brake upgrade from m310 brake series. Already have noticed improvement in the past two rides with mixed terrain and technical features. I have'nt had a chance to completely hammer on the Shimano XT series brake system with the Ice Tech rotors but look forward to future rides with the better brakes in place. Ice Tech rotors are easy to install and provided you purchased the adapter for 180mm rotors (if moving up from smaller rotors) see technical info or call support if unsure. Order came well packaged for safe shipment. Best brake rotors I have used yet. Solid construction...great stopping power with my XT brake set...awesome! Great upgrade with XT brakes; easy install and NO brake noise! these rotors are awesome. They lasted 3 seasons of almost daily riding, using metallic pads. They only make noise when the pads are worn down to nothing, otherwise, they are completely quiet. Paired with the xt brakes, they are the perfect, 1 finger setup. Some people call this(?) rotor a Shimano "Deore" XT 6-Bolt Ice-Tech Rotor, a Shimano "Saint" XT Ice-Tech rotor, and Jenson USA doesn't specify either "Deore" or "Saint". Are all these rotors the same? People just referring to them by different names, ie "Deore", "Saint", or no name? Does the rotor sold on Jenson USA have a manufacturer part number? I have Avid BB7's on my Specialized Secteur road bike; ordered these rotors but they seem to be way too thick, even with both pads backed all the way off. Also the little tab on the inside (right) pad rubs the bolts on the inside of the black centre piece of the rotor where it connects to the outer silver piece. Not a little, but a lot. BEST ANSWER: This doesn’t sound like a question. What are the best pads to use with this rotor? I am currently using the SLX brake calipers. BEST ANSWER: I ride in the mountains and feel like the resin offers a little more bite and immediate power. I go through several pads a season so I don't want to have to wait a long time to break them in. Also the resin is more forgiving if you get oil on them. I'm using the resin pads because they are quieter than the metal. However, it depends on your terrain ; in TX and OK there's less concern about extreme stopping power. If you are in the mountains, metal might be a better choice.. I like the resin pads better. I also like hitting everything with isopropyl alcohol as I am changing pads and clean the rotor. I'm using my XT caliper and the Shimano pads that came with it. All good. I use the Ice resin pads. Seems to work in all conditions. Is this the correct adaptor for a 203 rotor with a 160mm fox 34 fork mount and guide caliper? BEST ANSWER: If the fork is natively for 180mm rotor, yes. If natively 160mm, then the offset adapter (oddly also listed here as f203p/p). BEST ANSWER: yep, absolutely... I have tried expensive ice tech fin pads, or the resin xtr 6 dollar pads... I kind of like the cheaper resin though they go quicker, but less squeel. I had to take a blow torch and just 15 seconds or so torched my pads and rotor surfaces to burn off chemicals, and then they went silent and perfect for me... even new they squealed. Yes. I have been running these rotors with resin pads for two seasons with no issues. You can, however it is recommended that you also get the ice tech pads. I kept the original pads for now. Hope this helps. Sure, I'm using this for years, works great. Are these disks used with resin or metallic pads ? Either pad will work fine. Which ever type you choose originally should be used when replacing in future. I use the JO2A resin pads with these rotors. Incredible stopping power with no squeak. BEST ANSWER: Yes, just get the same rotor size. As long as you have 6-bolt mounting it will be good. If you have center lock get the center lock rotor. Yes you can use XT rotors with other Shimano group calipers without issue. as long as you are replacing 180mm with 180mm you should be good to go. do these work with shimano rotors and adapters? BEST ANSWER: I am running them with shimano adapters and rotors and they work amazing!!! Magura is THE MOST difficult hydraulic braking system to maintain and no it is not compatible. Adapters are very specific to fork, frame, rotor diameter and year of brake system manufacture. If you can afford it, purchase an all XT system, new in box and have it professionally installed. My XT braking is without parallel. Will these work with xt-8020 4 pot brakes? BEST ANSWER: Yes, they will work perfectly with the 8020s. I actually use the same setup on my Santa Cruz 5010 for my front brakes . Yes they will. That is what I am running with mine. what's the difference these and the other ones? They disapate heat quicker. Handy when your wife rides the brakes downhill in Colorado! The Ice-Tech rotors are designed to help reduce vibration and heat. Are these compatible with shimano hydro road? I have them on my road bike and they work fine. I have a Rockshock 16' Pike fork, and wanted to go from 180mm rotor to a 203mm Ice-tech rotor. I bought the front 203mm spacer that resembled my current 180mm spacer, but the 203mm rotor seems too big for the 203mm spacer. Any ideas? BEST ANSWER: I have a shimano adapter on my Pike with 203mm rotor and SLX brakes. It works just fine. According to Rock Shox, the max rotor size it will take is 200mm. currently have a 200mm centerline rotor on my rockshox lyric fork what adapter do I need to run the 203mm rotor? 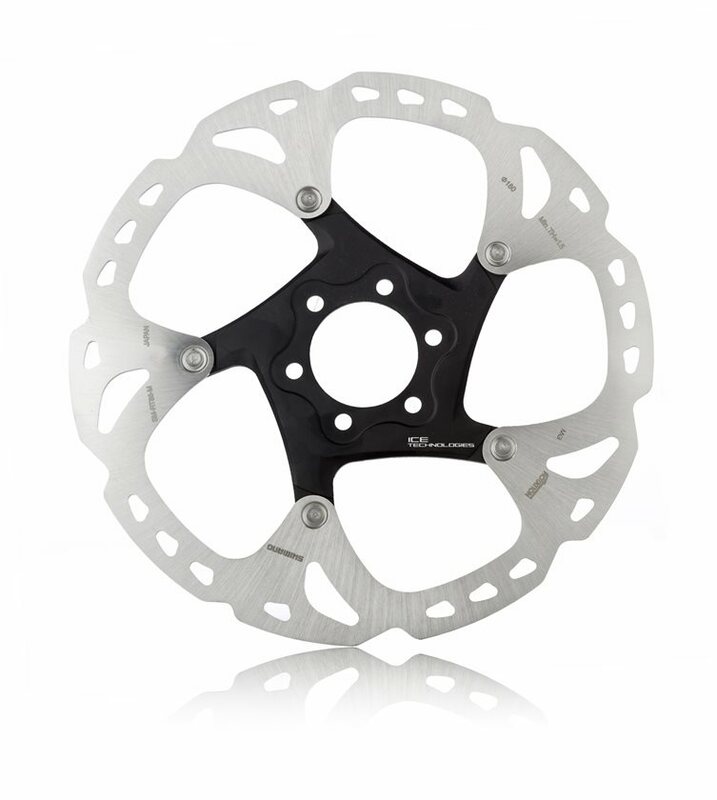 BEST ANSWER: Which freehub should I use with this Disc Brake? BEST ANSWER: Basically Nothing. They’re both utilized to slow your ride.